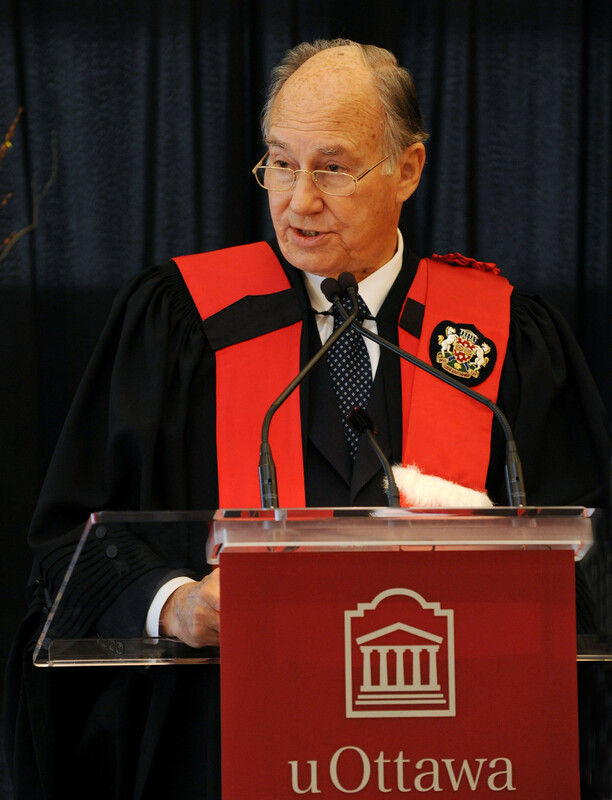 His Highness the Aga Khan addresses the University of Ottawa convocation, where he was awarded an honorary doctorate. First of all, allow me to express my deep gratitude for the great honour you have bestowed on me. At the same time, I am delighted to share this moment with all those who have been invited here today, for you are all friends, some long-standing, others new. I would also like to show my appreciation of the excellent cooperation by members of your University, your city and your country from which the Aga Khan Development Network has benefited. A very recent example of this is, of course, the Global Centre for Pluralism, our joint venture with the Canadian government, a project which has now become a reality here in Ottawa. I should point out that your Chancellor, Huguette Labelle, is a member of the Centre’s Board of Directors, just one of the many ways in which she has personally contributed to projects in which I myself am deeply involved, not to mention the innumerable services she has rendered to Canada and the rest of the world. Today, I am more than happy to offer her a very special greeting to mark the moment at which her high-level responsibilities at the University of Ottawa in her years as Chancellor – eighteen in all – come to an end. The spirit of cooperation to which I referred, both at personal and institutional level, is very much a reflection of our shared concern with the challenges currently facing our world. In this regard I have been pleased to see that the University of Ottawa has focused attention on many of these challenges in its new strategic plan, Destination 2020. For example, your commitment to bilingualism reflects our own desire to promote a spirit of pluralism and our firm belief that the affirmation of cultural identity in no way inconsistent with the idea of encouraging intercultural cooperation. Indeed, the two movements sustain each other. I am also impressed by the interest taken by the University in a wide range of health and molecular sciences and communications technology, an interest which our Network shares. There are many topics of mutual interest that I could talk about today. But I have picked just one. In my eyes it is important – and I understand that it is also high among your priorities. I refer to the field of governance and public policy, and, specifically, to the difficulty of establishing workable constitutional systems – especially in countries with less experience in democratic governance. As you know, my own interests in the last 50 years as Imam of the Ismaili community, have been primarily focused on Africa, South Asia, Central Asia and the Middle-East – and on improving the quality of life for the people who live there. The more I think about this matter, the more I am persuaded that one of the critical barriers to progress is the way in which governing processes occur. The University of Ottawa has a long tradition of sharing internationally in the hard work of intellectual inquiry. Canada’s Governor General recently referred to this process as “the Diplomacy of Knowledge.” And it seems to me that questions of constitutional governance in the developing world deserve a particularly high place on that agenda. The so-called Arab Spring has brought special attention to this challenge – illustrating that it is easier to rally people in opposition to a particular government than to forge agreement about new governing processes. But, while this pattern has recently been more dramatically evident, it has been a reality for a very, very long time. In my life, the two moments which contributed most dramatically to this condition were the fall of the British and French colonial empires after World War II – and then the disintegration of the Soviet Union and its Eastern European empire two decades ago. The process continues today, as developing nations re-examine – sometimes peacefully, sometimes violently – the structures under which they are governed. In some cases and I think here of Kenya’s very new constitution – power has been diffused – in response no doubt to pressures from ethnic, economic, religious and other centrifugal forces. One risk of decentralization is that it can place more decision-making power into the hands of communities that have had less access to education and governing experience, and less exposure to national and global issues. Perhaps this is why, in some cases, the trend has been to consolidate governing authority – such as in Afghanistan, with the aim of overcoming inertia and inefficiency – as well as – fragmented and provincial outlooks. The history of constitutions can be seen, as an oscillation between the two poles of centralization and diffusion – with new concentrations of power often amplifying the temptation to abuse, while new dispersions of power are often associated with stagnation, paralysis and even more opportunities for corruption. Arrangements that effectively balance power – through a federalist approach, for example, are elusive. What is critical is that constitutional arrangements should respect inherited traditions, ensure fairness to minority communities, respond to rural as well as urban concerns and underwrite equitable opportunity for a better life. Reconciling the global and the local, the urban and the rural, the regional and the national, is a formidable challenge – one that calls for the best of our intellectual energies and consistent fine-tuning over time. There is a second question related to the experience of fledgling – and often failing – democracies. In much of the developed world, we have seen the emergence, over time, of two-pronged political structures – where one party forms a government and the other constitutes the opposition. This arrangement can foster greater accountability and even a certain stability. But I have to say, I am increasingly sceptical about the emergence of such constructs in many developing countries. To the contrary, I suspect that a continuing multiplicity of widely differentiated parties will mean that some form of coalition government will become the norm. This will especially be the case, of course, in societies that are – multi-cultural, multi-religious, or struggling to accommodate secular and religious political forces. The difficulty is, however, that multi-party coalitions can be intrinsically undisciplined, with their differing agendas, and often unstable. In such situations, the threat of defection can be highly destabilizing, while accountability is often blurred and transparency is discouraged. Yet, coalition governance is now becoming a familiar form of government in many countries of Asia, Africa and the Middle East. The broader the array of parties, the greater the risk that they will be based on personalities or narrow parochial identities, rather than a broadly-recognized, predictable point of view. There is certainly no straightforward, universal formula to apply in such situations. We must not naively assume that what has worked in some parts of the western world, for example, will also work the same way in less developed contexts. Different places, different histories require quite different approaches. The questions raised by coalition governance are not easy ones – either in the developing world or the developed world. What should be the rules under which parties and other governing entities are put together? How can we best find the glue that will hold them together – such as joint commitments to issues of clear national interest – and to a spirit of pluralism which values conciliation among diversified viewpoints? Let me emphasize that I am not opposed to the concept of coalition government. Indeed it may be an inevitable response to the intrinsic pluralism of many of the countries in which I work. But the high level of political instability and failure around the world illustrates the need for creative new thinking about this particularly demanding form of democracy. What constitutional options and best practices will give coalition government the greatest chance of stability and consistent, high quality performance? The alternative is a world widely characterized by significant numbers of unstable states. It is a scenario to be avoided. Again, the discussion of comparative political systems is just one of many conversations in which the great universities of the world should be vital participants. Our own Aga Khan University is now planning a new Graduate School of Government, Public Policy and Civil Society to help address these issues. And surely this is a discussion in which the University of Ottawa can make a special contribution – given the commitment you have articulated to research, the topic of “Canada and the World” – your focus on international intellectual engagement – including 140 bilateral university agreements – your emphasis on fostering democracy, and, indeed, the creation of a new premier Centre for Governance and Public Policy Research. I know, too, that this University’s global effectiveness is reinforced by the high regard in which Canada is held as a valued international partner. In my experience, a country’s standing in our contemporary world is no longer recognised by what it can achieve for itself, but by what it can do for others. In this context, Canada has truly become a great, world power.